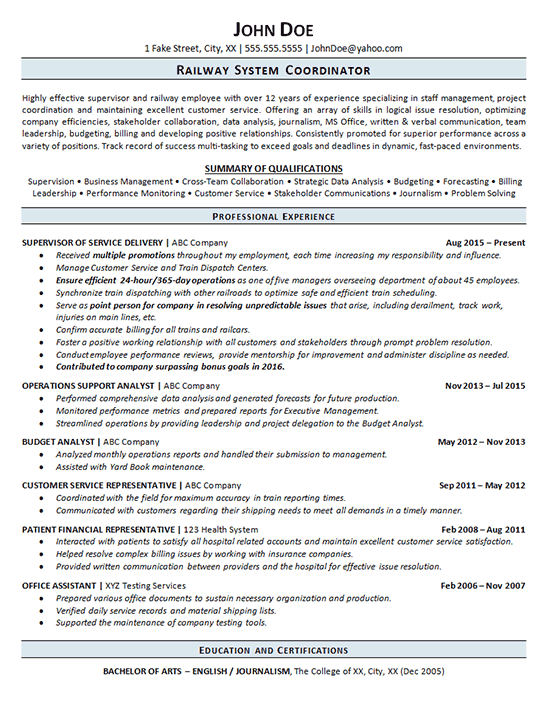 This railroad resume was created for a client that specialized in managing and railway operations for optimized efficiency. One potential concern is that this job seeker has held numerous jobs over the past decade. Many times, there are valid reasons for this and it’s not necessarily an issue, but some employers may see it as a red flag. While that can’t be changed, we did start the resume with an Introductory Paragraph and Summary of Qualifications to truly highlight the client’s strengths and relevant skillset that would interest potential employers. With employers often deciding on a resume within the first few seconds, we want to make sure the first impression is a good one. That includes a layout and format that is pleasing to the eye. Following the client’s Professional Experience, his college degree was listed to demonstrate his impressive education background. Highly effective supervisor and railway employee with over 12 years of experience specializing in staff management, project coordination and maintaining excellent customer service. Offering an array of skills in logical issue resolution, optimizing company efficiencies, stakeholder collaboration, data analysis, journalism, MS Office, written & verbal communication, team leadership, budgeting, billing and developing positive relationships. Consistently promoted for superior performance across a variety of positions. Track record of success multitasking to exceed goals and deadlines in dynamic, fast-paced environments. Received multiple promotions throughout my employment, each time increasing my responsibility and influence. Manage Customer Service and Train Dispatch Centers. Ensure efficient 24-hour/365-day operations as one of five managers overseeing department of about 45 employees. Synchronize train dispatching with other railroads to optimize safe and efficient train scheduling. Serve as point person for company in resolving unpredictable issues that arise, including derailment, track work, injuries on main lines, etc. Confirm accurate billing for all trains and railcars. Foster a positive working relationship with all customers and stakeholders through prompt problem resolution. Conduct employee performance reviews, provide mentorship for improvement and administer discipline as needed. Contributed to company surpassing bonus goals in 2016. Analyzed monthly operations reports and handled their submission to management. Assisted with Yard Book maintenance.